TORONTO, Feb. 11, 2019 /CNW/ - Roxgold Inc. ("Roxgold" or "the Company") (TSX: ROXG) (OTC: ROGFF) is pleased to announce that it has entered into an agreement with Newcrest West Africa Holdings Pty Ltd ("Newcrest") to acquire a portfolio of 11 exploration permits in Côte d'Ivoire (the "Tenements"), which includes the Séguéla gold project ("Séguéla"), for total upfront consideration of US$20 million (the "Transaction"). All amounts in this news release are expressed in US dollars. Roxgold is acquiring the Tenements from Newcrest for upfront consideration of $20 million. Roxgold is also committing to a further payment of $10 million in cash upon production of the first gold from any of the areas covered by the Tenements. Closing of the Transaction is dependent upon, amongst other things, the renewal of certain tenements and the approval from the Minister of Mines of Côte d'Ivoire and other required regulatory approvals. The Tenements are located across prospective Birimian greenstone belts in the established mining jurisdiction of Côte d'Ivoire and includes highly prospective early stage projects as well as advanced stage projects throughout Côte d'Ivoire (See Figure 1). To date, approximately $21 million dollars has been invested in exploration and approximately 117,000 metres of drilling has been completed on the Tenements, allowing for significant scope to build upon existing data and exploration work completed to date. Included in the portfolio is the advanced exploration Séguéla gold project that hosts the near surface Antenna gold deposit. Séguéla is located approximately 240 kilometres north-west of Yamoussoukro, the political capital of Côte d'Ivoire, and approximately 480 kilometres north-west of Abidjan, the commercial capital of the country. The Antenna gold deposit consists of near-surface, potentially open pittable mineralization and is ideally located near existing infrastructure including grid power, transport and water resources. 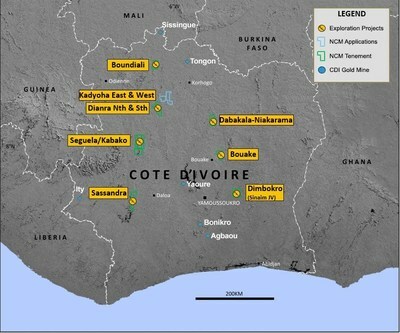 Newcrest has been operating in Côte d'Ivoire since 2010 and discovered the Antenna deposit in 2016. Roxgold intends to keep key infrastructure and personnel in place to ensure a smooth transition of activities at site. A maiden mineral resource was declared at Séguéla's Antenna deposit in December 2017 in accordance with JORC 20121. (*) The mineral resources presented are as defined under the JORC Code, which is materially consistent with National Instrument 43-101. The Company is currently undertaking work to support a conversion from JORC reporting standards to National Instrument 43-101 reporting which is expected to be completed in the first half of 2019. Furthermore, Séguéla presents a significant opportunity to further assess multiple priority exploration targets within 15 kilometres of the Antenna deposit. These targets have the potential to increase the resource base and enhance the potential economics of the Séguéla project by adding low-cost near surface ounces (see Figure 2). 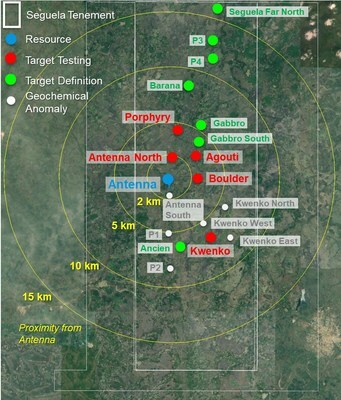 In addition to Antenna, early stage drilling by Newcrest has produced results ranging from trace to 14 metres at 58.1 g/t Au from 0 metres, and including several high-grade intercepts from the nearby Agouti, Boulder, Kwenko and Ancien prospects, all of which support the potential to add additional ounces to the project. 7 metres at 9.1 g/t Au in SGRC161 from 18 metres. 11 metres at 5.1 g/t Au in SGRC187 from 21 metres. 16 metres at 9.3 g/t Au in SGRC172 from 37 metres. Roxgold intends to elaborate on its near-term exploration plans for Séguéla prior to the end of the current quarter. In addition, significant exploration potential exists across the balance of the Tenements with large total holdings covering 3,298 km2. These early stage, prospective regional opportunities exist on the Dimbokro, Dianra North and South, Boundiali and Bouake Permits (see Figure 1). Raymond James Ltd. has acted as financial advisor and Norton Rose Fulbright has acted as legal advisor to Roxgold. Roxgold is also pleased to announce that Mr. Paul Criddle will be returning to the Company in a full-time executive capacity as Chief Development Officer. John Dorward, President and Chief Executive Officer of Roxgold commented, "We are very pleased to have Paul returning to Roxgold in an executive function. Paul was the prime mover for the definition and development of Yaramoko which has been one of the most successful projects developed by a junior in recent years. In terms of its current stage, Séguéla is of nearly identical scale to when we started with Yaramoko so I am very pleased to have Paul back in an executive capacity to lead the efforts on our second growth project." As part of his transition to an executive function, Mr. Criddle will step down from his current role as a non-executive director of Roxgold. Paul Weedon, MAIG, Vice President, Exploration for Roxgold Inc., is a Qualified Person within the meaning of National Instrument 43-101, having verified and approved the technical data disclosed in this press release. This includes the sampling, analytical and test data underlying the information. Roxgold is a gold mining company with its key asset, the high grade Yaramoko Gold Mine, located in the Houndé greenstone region of Burkina Faso, West Africa. Roxgold trades on the TSX under the symbol ROXG and as ROGFF on OTC. This press release contains "forward-looking information" within the meaning of applicable Canadian securities laws ("forward-looking statements"). Such forward-looking statements include, without limitation: statements with respect to closing of the proposed Transaction, Mineral Resource estimates (including proposals for the potential conversion thereof from JORC to National Instrument 43-101 standards, and the anticipated timing thereof), anticipated receipt and maintenance of permits and licenses and renewal of the Tenements proposed to be acquired, future potential production, satellite opportunities and exploration and development potential of the Tenements, retention of personnel and existing infrastructure following the Transaction, future expansion and development plans, proposed exploration plans and the timing and costs thereof, the anticipated costs, timing and sufficiency of future funding. These statements are based on information currently available to the Company and the Company provides no assurance that actual results will meet management's expectations. In certain cases, forward-looking information may be identified by such terms as "anticipates", "believes", "could", "estimates", "expects", "may", "shall", "will", or "would". Forward-looking information contained in this news release is based on certain factors and assumptions regarding, among other things, satisfaction of all closing conditions to the completion of the Transaction, the estimation of Mineral Resources, the realization of resource estimates, the timing and amount of future exploration and development expenditures, the estimation of initial and sustaining capital requirements, the estimation of labour and operating costs, the availability of necessary financing and materials to continue to explore and develop the Tenements, the progress of exploration and development activities as currently proposed and anticipated, the receipt of necessary regulatory approvals and permits including renewals of the Tenements, and assumptions with respect to currency fluctuations, environmental risks, title disputes or claims, and other similar matters. While the Company considers these assumptions to be reasonable based on information currently available to it, they may prove to be incorrect. Although the Company believes the expectations expressed in such forward-looking statements are based on reasonable assumptions, such statements are not guarantees of future performance and actual results or developments may differ materially from those in the forward-looking statements. Factors that could cause actual results to differ materially from those in forward-looking statements include: failure to satisfy all closing conditions to the completion of the Transaction, changes in market conditions, unsuccessful exploration results, possibility of project cost overruns or unanticipated costs and expenses, changes in the costs and timing of the development, inaccurate resource estimates, changes in the price of gold, unanticipated changes in key management personnel, failure to obtain permits or renewal of the Tenements as anticipated or at all, failure of exploration and/or development activities to progress as currently anticipated or at all, and general economic conditions. Mining exploration and development is an inherently risky business. Accordingly, actual events may differ materially from those projected in the forward-looking statements. This list is not exhaustive of the factors that may affect any of the Company's forward-looking statements. These and other factors should be considered carefully and readers should not place undue reliance on the Company's forward-looking statements. The Company does not undertake to update any forward-looking statement that may be made from time to time by the Company or on its behalf, except in accordance with applicable securities laws. 1 Newcrest declared an inferred mineral resource of 5.8Mt at 2.3 g/t Au for 430koz Au for the Antenna Deposit in their Annual Mineral Resources and Ore Reserves Statement – 31 December 2017 in accordance with JORC 2012, released to the ASX on 15 February 2018. 2 Potential quantity and grade is conceptual in nature. There has been insufficient exploration to define a National Instrument 43-101 compliant mineral resource on the Tenements and it is uncertain if further exploration will result in the Tenements being delineated as such a mineral resource.